One of my pet hates is using data in a misleading way to hide your own misgivings and this one is fairly blatant. On treehugger a few days ago an article was published about a Chinese pork producer proposing a purchase of America’s largest pork producer – Smithfield. Now, yes any developing country buying a developed country businesses is worth discussion but apparently not as much as developed country companies buy developing country companies, but anyway thats not the point of this post. The point is the blatant misuse of data to highlight the shock of the story. Now there are some semantics in this a 5% drop in meat consumption isn’t that much to brag about and an 18 percent increase in meat consumption isn’t exactly a ‘leap’! But that’s not the point. What is blatantly misleading is stating that meat consumption is “twice as much as in the United States”. 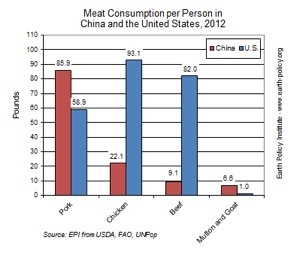 Well yes meat consumption per country is twice as much but meat consumption per person in China is half what it is the US. Australia isn’t much better at 10% less than the US. In pig terms, if we all got all our meat from just pigs the average American would eat one whole pig to themselves each year versus half a pig per person in China. So what it should say is “although meat consumption in China has risen by 18% to 78 million tonnes, the meager 5% reduction in meat consumption in the United States still means that the United States consumes twice as much meat per person than China”. The same data but it reads very differently. On a final note, an article on Forbes covers the more political side of the story and talks about one objection being that “the Chinese will ply the domestic American market with imports of unsafe, disease-infested, chemical-ridden pork.” Ignoring the fact that the ownership is about exporting pork from the US not importing it Forbes also points out “Chinese ownership of Smithfield might actually improve food safety standards in domestic U.S. pork production rather than compromise them”. Sounds similar to my post about what happened with developed countries exporting waste to China. So Smithfield will benefit from increased revenue and they have stated they will ‘grow’ 50% of their pigs without using Ractopamine so the American pork will be healthier sounds like a win win to me. As the developed countries become outsourcing nations for developing countries we need to be careful not to hide our own shortcomings by lying about someone else’s.